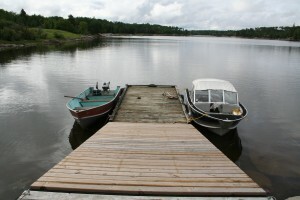 Boating safety at the cottage is all about common sense and proper precaution. Here are some tips to make the boat ride safe for everyone. Most boating accidents at the cottage are preventable, yet every year hundreds of people are injured or killed while fishing, skiing or simply cruising around. The following suggestions seem simple, but it is the simple things that make all the difference. How do you keep everyone safe in the boat? Always wear your life jacket, even for short trips. You never know when you might hit a log, rock or be suprised by large waves from a passing boat. Don’t stand up in your aluminum fishing boat. Small boats can be very unstable. If you have to answer nature’s call, do it in a plastic container or a bailing can. Avoid boating at night, especially if you are unfamiliar with the area. The points of reference change or even disappear once the sun sets and even experienced boaters get disoriented when boating at night. Floating logs or other debris are almost impossible to detect at night. Saving a person who falls overboard at night is very difficult. Make sure your lights are working properly and keep spare bulbs in the boat in case you are out at night. Other boaters need to be able to clearly see you from both sides when they are approaching you. Always check the weather report before you head out. When you see bad weather coming, head home early. Never assume that you can outrun a storm. Tell someone where you are going and how long you plan to be out on the water. Stick to the schedule and the original destination route. Always check the fuel level and do a quick inspection of the motor before you leave the dock. Be sure to have more than enough fuel for the entire trip, and give yourself enough of a safety cushion to account for bad weather and a possible change of course that may use more fuel than anticipated. Never overload the boat with people or supplies. One wave can sink it in minutes. It is worth the extra time and money to do several trips rather than putting the boat and passengers at risk. Carry the required safety equipment at all times. Double check to make sure that all the safety gear is aboard and in good condition before you head out. Take your time. Speeding increases your risk of hitting a log, reef or other unexpected obstacles. It also uses a lot more fuel which is very expensive these days. Don’t drink and drive. It’s just as dangerous on the water as on the road and the rules in most jurisdictions are the same as if you are driving a car. Following a few common sense rules will ensure the boating season is a safe one for the entire family. Go to the Boat Maintenance page. Go to the Boat Trailer Advice page.